There are few things worse than paying out of your nose for a flight, but stumbling across an insane travel deal after it's expired must be one of them. Thanks to DealRay, that'll never happen again, as signing up for the service means getting instant SMS alerts with the cheapest airfare deals currently available straight to your phone. According to the site, users save an average of $318 on deals through the service, which is how we heard about the Philadelphia to Copenhagen flight for a paltry $144 from May through January, or the $99 one-way flight from Boston to Reykjavik (still only $264 for a roundtrip anytime in April through June). 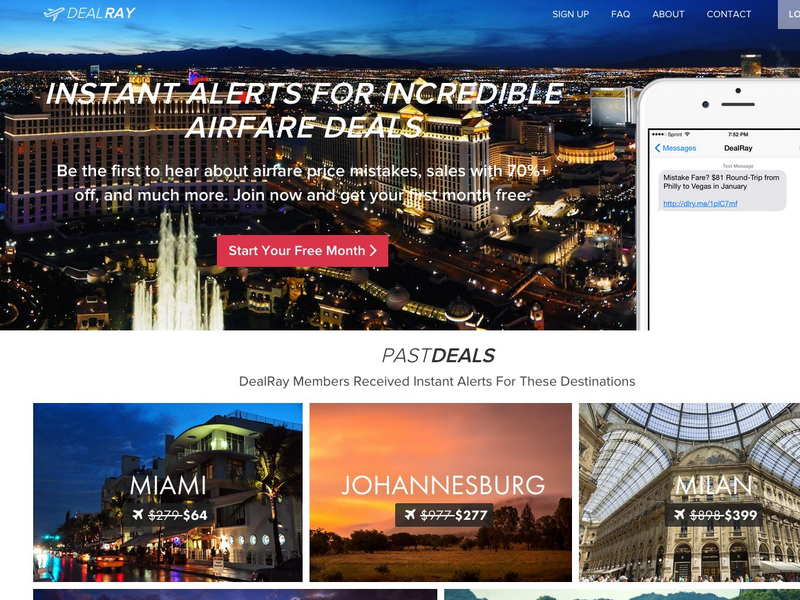 Unlike sites like Airfarewatchdog, which allows you to monitor specific destinations for deals, DealRay works best if you're open to taking a trip anywhere in the world, as long as the price is right. Basically, they have a dedicated team of techies and travel industry insiders working together to find the best deals (only originating from the US for now) as soon as they happen. If you're thinking this is too good to be true, there's just one small caveat: after one free month in which you're bound to get addicted to the service, DealRay starts charging a monthly fee of $9.99. And since DealRay knows that no one wants to get spammed with texts, they promise to only send a text every day or two, but since they often send deals that may expire in a matter of hours, you won't mind hearing from them.